Should I Buy a Standing Desk or a Converter? Should I Buy a Desk Cycle or a Treadmill Desk? Sitting, standing, and walking can all be healthy parts of your workday—however, doing any of them for too long can lead to problems. Excess sitting leads to increased risk of many chronic diseases including obesity and heart trouble, while prolonged standing can lead to sore feet and varicose veins in the legs. Studies have found that while walking can increase mental acuity, it can potentially be distracting while performing certain tasks. Improper use of a treadmill can also cause soreness throughout the body (more on that below). It’s best to be in each position for a period of roughly one to two hours at a time. In an eight hour workday, try to fit in one or two sessions of standing, walking and sitting (with the primary benefit of sitting being rest). Remember, the next position is your best position. Standing—Your default position, since it’s easy to be productive, with the added bonus of avoiding the hazards of sitting disease. In addition to the health benefits, it also tends to lead to easier collaboration between coworkers. Another benefit of standing is that it’s easier to manipulate objects around your desktop—if you find yourself working with a lot of papers, standing gives you a bit more mobility to manage a large surface area. Before you leave work each day, make sure your desk is in the standing position. This will prompt you to start your next day standing. To help you stand longer and stay comfortable, try one of our EcoLast Premium Standing Mats. Walking—Walking is ideal for reading, watching videos, or making phone calls—however, his doesn’t mean that typing while walking is something to avoid. The most natural way to type while walking is to use a SteadyType keyboard tray, so that you can more easily adjust to an ergonomically correct position while your body is in motion. Sitting—Great for taking a break from standing or walking. While this was once the de facto position for working at a desk, the health risks of sitting disease have displaced it as the old standard. It’s best to avoid sitting for too long, but in moderation, it can still be a healthy part of your day. Set a timer on your phone or computer to remind you to stand up, as it can be easy to lose track of time and sit longer than intended. It will take some time to find your “sweet spot,” but we generally recommend a leisurely 1.5 mph as a reasonable goal. You can adjust your speed up or down accordingly. If you find yourself walking for long sessions, it also helps to vary your speed by one or two tenths of a mile every now and then to avoid soreness. It’s also important to take long strides. Most first time treadmill-deskers start out by taking short steps, and quickly tire out as a result—you need to change your gait slightly to work while walking. If you don’t pace yourself when you’re starting out, you’ll invite muscle pain, and you may even think about giving up treadmill desking altogether. The solution is simple—start slow! Start out on your first day with two fifteen minute sessions. Scale up by increasing your daily total by five minutes (that is, 2.5 minutes on each session), or more if you’re not feeling tired out. Soon, you’ll be up to an ideal and sustainable 90 minutes twice per day. It’s also important to remember the difference between exercise (cardio) and Non Exercise Activity Thermogenesis, or NEAT. Using a treadmill desk is an example of NEAT—you should not be exerting yourself hard enough to sweat. Not only would this make working basically impossible from a physical perspective, it would also strain your ability to concentrate and think logically. Light movement, like a leisurely stroll on a treadmill, still burns calories throughout the day while keeping your blood flowing and staving off sitting disease, without preventing you from completing your work. That being said, you do need cardio. Doctors recommend at least 150 minutes per week of moderate exercise or 75 minutes per week of vigorous exercise. The best way to minimize the chances of negative health effects like diabetes and heart disease is to minimize time spent sitting while also keeping up with a cardio routine. Swimming, running, biking, or certain sports can help you keep up with your cardio goals. Once you’ve decided that you want to work while standing, you have two options: an adjustable-height desk or a sit-stand converter. Adjustable-height desks (also known as standing desks) are just that—they’re like traditional desks with height-adjustable tabletops, either via a motorized base or a manual crank system. Sit-stand converters (also known as desktop risers) are meant to be placed on your fixed-height desk, converting it into a sit-stand workspace. Some sit directly on top of your desk, like the Ziplift, while others, like the Cadence models, attach to the back of your desk. 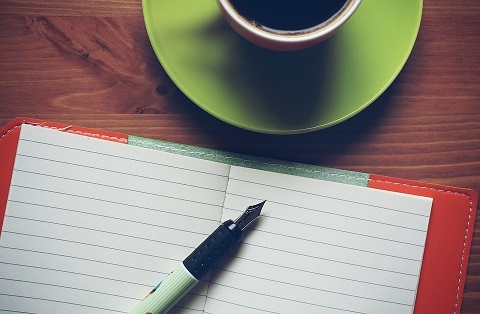 Both options provide a healthier way to work, and there are good reasons for choosing each. You want to save space. Maybe you work with a lot of papers, or maybe you just like to keep your desktop fully loaded with materials. Desktop converters can cut into your desktop space, while iMovR’s standing desks are available in a wide variety of sizes to accommodate your needs. Choose a standing desk if you want the maximum amount of desktop real estate for your work. You plan to use a treadmill. 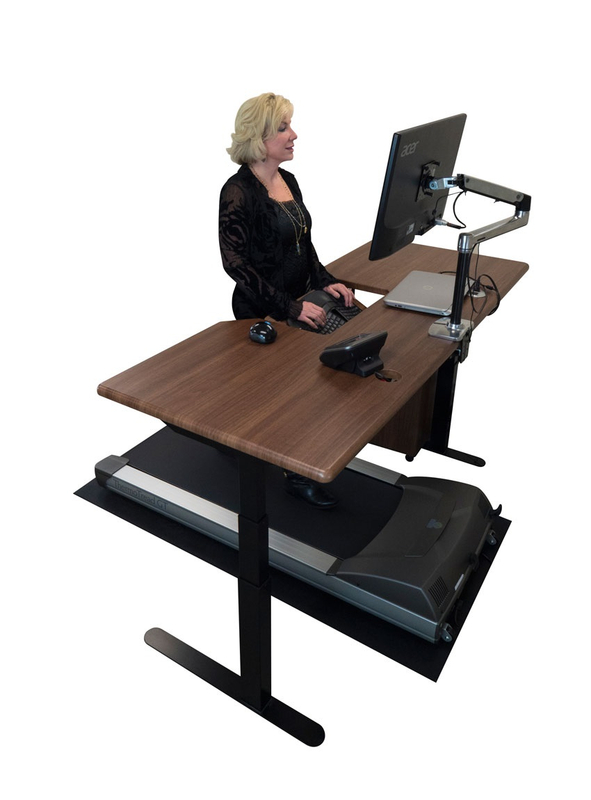 You’ll have a much smoother experience using a standing desk for treadmill desking, rather than using a converter as a substitute, because all iMovR standing desks are designed to pair with the ThermoTread GT Office Treadmill. 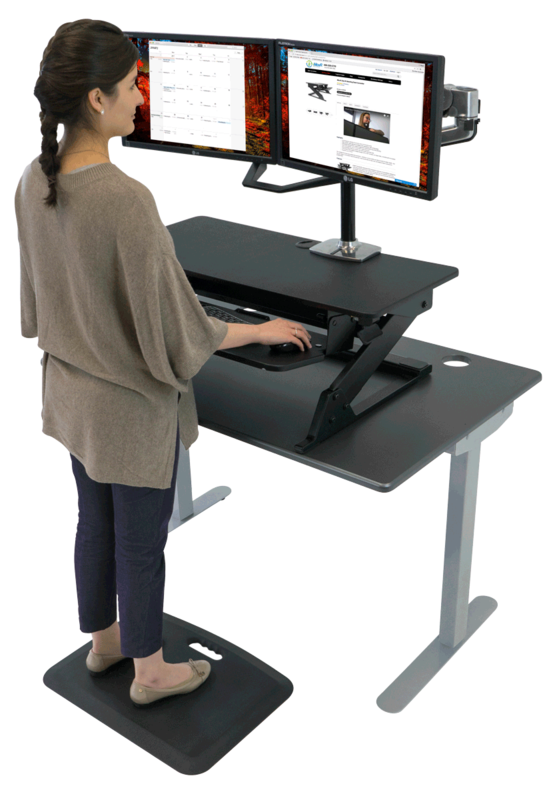 Additionally, because you tend to anchor your wrists to the keyboard while walking, you’ll want the inherent stability of a standing desk for that functionality. Even if you plan to use a treadmill desk at some point down the road, it’s a good idea to go with a standing desk now and avoid a frustrating set-up later. You want the advanced ergonomics of SteadyType™. While the ZipLift delivers excellent ergonomics with an adjustable keyboard tray, nothing compares to the complete ergonomic adjustability of SteadyType. The ability to adjust your keyboard to any angle combined with the stability of a built-in tray allows you to achieve unmatched ergonomics. This is especially important for treadmill-deskers, who need a neutral and strain-free hand position while in motion. We recommend a 15-20 degree tilt for stationary standing users, and a 30-35 degree tilt for walkers. You want the best looking option. iMovR desks feature beautiful 3D-laminated tops with the look of real hardwood. An iMovR desk is a complement to your room’s decor, while converters tend to be focused on functionality more than looks. Plus, the cleaner aesthetic of an adjustable-height tabletop leads to less cluttered space, helping you stay focused on finishing your work. You have a built-in desk. This is a no-brainer! If your desk is built-in, then a converter is the best option to stand up to sitting disease. You don’t want to give up your drawers. If you find yourself frequently accessing your desk drawers, you probably are not willing to give them up to switch to a standing desk. However, iMovR’s Mobile File Cabinet provides a solution. It matches your tabletop and doubles as a seat, giving standing desk users back their valuable drawer space. It’s a common misconception that standing desks are vastly more expensive than converters. 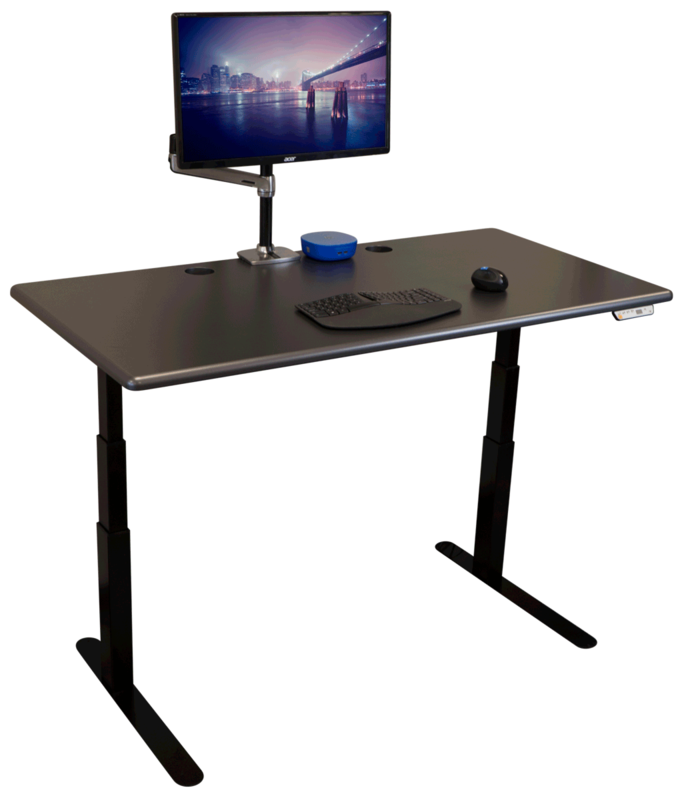 While iMovR’s top-of-the-line standing desks dwarf the price of our converter options, you’ll also find the entry-level iMovR Ellure desk to be competitively priced with our converters. While desks may be more expensive in general, you should definitely consider both options when planning your workstation, regardless of how big or small your budget may be. Should I Buy a Treadmill Desk or a Desk Cycle? If you’re just getting into the world of office fitness, you’re probably exploring the different options in a category known as active workstations. Treadmill desks and desk cycles are popular products that enable you to stay active at your desk. Desk cycles are less expensive than treadmill desks, and they aim to accomplish the same general goal: adding more movement into your sedentary lifestyle. You may be wondering, “Why should I go with a more expensive option that does essentially the same thing?” The truth is that these products aim to accomplish very different things. 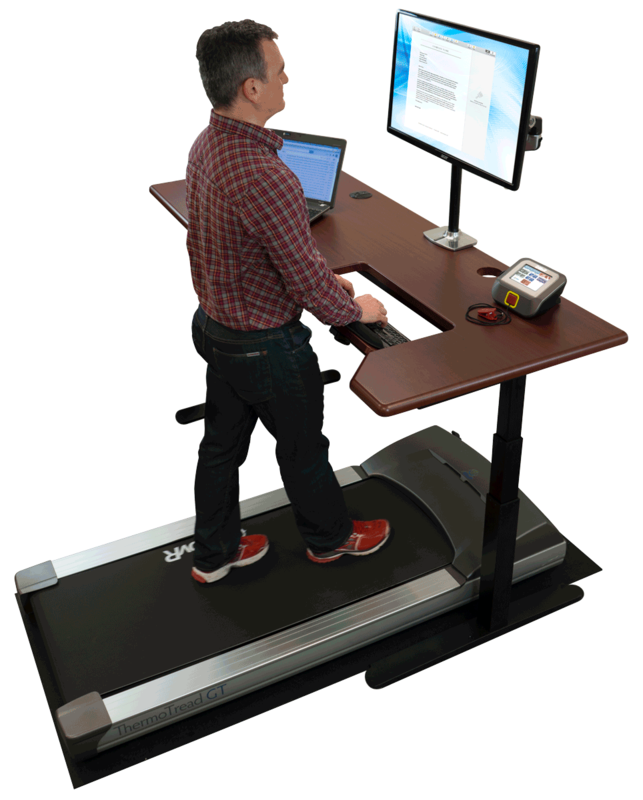 A treadmill desk is any integrated system with a treadmill and an adjustable-height desk. It should ideally be an office treadmill, designed for walking rather than running, like the iMovR ThermoTread GT. The treadmill and the desk are not connected (though they can be in some models). You can perform all your normal desk activities while walking. Pros of a Treadmill Desk: Treadmill desks provide NEAT, or Non Exercise Activity Thermogenesis. This means that you get to stay active without shifting into full blown cardio mode—you shouldn’t be sweating or breathing heavily while on your treadmill desk, you should be working and walking in harmony. Treadmill desks get your calf muscles moving, and they increase your basal metabolic rate. They’re proven to help with obesity, diabetes, and triglyceride levels. They emulate a natural human behavior of thinking while walking, as opposed to thinking while sitting at rest for eight+ hours a day. You may find that your mental acuity goes up when using a treadmill desk. If you’ve ever tried doing math while running, you know that it’s exceptionally hard—but because treadmill desks are designed for low speed use, you get the benefit of movement without the detriment (to your thinking capacity) of cardio. Finally, the positive effects of treadmill desking have been studied and there are more results posted in their support than the newer desk cycles. They lead to reported lower levels of stress and higher feelings of satisfaction vs. desk cycles. Cons of a Treadmill Desk: The hard truth is that treadmill desks take up more space and are more expensive. There’s no getting around that. If you’re looking to convert your office cubicle into an active workstation, your company’s policy may not reimburse you sufficiently, or you may not be able to fit the treadmill in the first place. The good news is that your increased productivity and health will save you and your company money in the long run. What is a desk cycle? The term “desk cycle” can refer to a few different products. 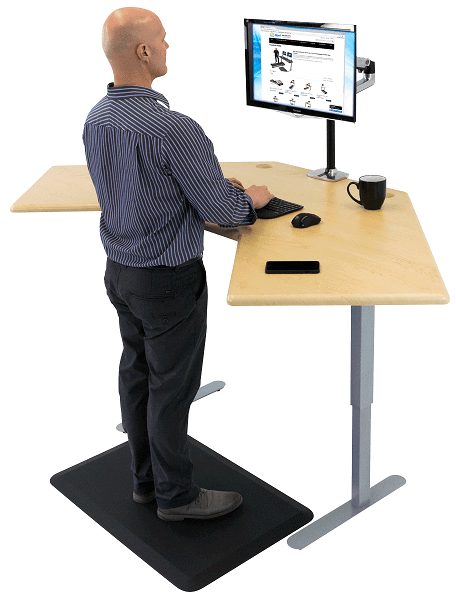 It generally refers to a pedaling device that’s placed under the desk, allowing you to exercise at your workstation. These can either provide a circular motion, like standard bicycles, or an elliptical motion. Here’s where it gets tricky: some people also use the term desk cycles to refer to desk bikes, which are a different animal entirely. Desk bikes are all-in-one products featuring a peddler and an attached work surface. These are not necessarily viewed as office fitness products. Desk bikes can be viewed as tackling the problem from a different direction—they aim to inject productivity into your exercise time, while other products aim to inject activity into your work day. One thing is common between desk cycles, desk ellipticals, and desk bikes: you are getting cardio exercise, and you it will be difficult to perform your normal office work while you’re cycling. For the purposes of this article, we will be referring to all of these products as desk cycles. Pros of a Desk Cycle: Desk cycles have a lower buy-in cost than treadmill desks, and they’re generally easy to fit into tight environments. They can provide a true cardio workout, albeit not while you’re working. Cons of a Desk Cycle: The main problem with desk cycles is that cycling requires more mental energy than walking, which is a “built-in” natural motion. Even when cycling slowly, your ability to concentrate on work decreases. After a brief acclimation period, treadmill desking doesn’t really stop you from doing anything you’d otherwise do at your desk. The same cannot be said for cycling. You may get a better cardio workout, but you can’t expect a better work day. One possible solution is to use your cycle sparingly, ie, between rounds of typing. You want to stay below the cardio level so you don’t negatively affect your concentration. Alternatively, you can go full cardio on your desk cycle while consuming content, like watching videos or reading, which should not be as impacted by strenuous activity. The bottom line: If you work in an office, a treadmill desk is the clear winner. It enhances rather than detracts from your ability to work. It gives you the ability to walk slowly throughout the day, just like your body was designed for. Desk cycles are better for enthusiasts looking for a workout while watching videos, but not as part of a true active workstation where you’re typing and performing other computer tasks. You’ve finally got your standing desk, and you’re wondering what to do next. Or perhaps you’re waiting for your standing desk to arrive, and you want to get a headstart on better health as soon as it does. Either way, this short guide will help you hit the ground running (or perhaps standing) with your new height-adjustable workstation. First of all, prepare your space. Make sure you have a level surface on which to place the desk. This will ensure that the linear actuators (the legs) of your desk operate at peak efficiency. If your desk is not level, you may find your desk straining and squeaking when elevating, especially when bearing heavier loads. All iMovR desks come with leveling pads installed on the feet. This means that even if your surface is slightly uneven, as most are, you can use the leveling pads to compensate, reducing the strain on the adjustable legs of your desk. Next, you’ll need to assemble the desk (unless you’ve selected the factory pre-assembly option). If your desk requires assembly, we also suggest placing a blanket on the ground to prevent damage to the floor or scratches to the tabletop while it’s upside down. Instructions are included with your iMovR desk. All iMovR tops are pre-drilled, so you will not need to drill any holes to assemble the desk—the only tool you’ll need is a screwdriver. Depending on your desk, the process should take 5-30 minutes, and it goes even faster with a friend. You can always opt for iMovR’s factory pre-assembly or white glove delivery to skip this step entirely. Finally, configure your desk to ensure proper ergonomics. It will take some time to get your desk to the correct height for you. Try to set your desktop height so that the top of your monitor is eye-level, and your wrists are not flexed too far upward or downward while typing—your hands should be just slightly angled upwards in relation to your forearms. There’s a lot more to say on ergonomics—please check out our dedicated guide on the subject. If you’re looking to assemble a desk not composed entirely of iMovR parts, you’ll have to put in some additional elbow grease. You’ll probably require a power drill to attach the tabletop to the base. We recommend vacuuming your work area before starting, as well as putting your tabletop on a blanket to protect the finish. Remember not to overload your iMovR base with too heavy a tabletop—the base weight ratings refer to the capacity of the base excluding tabletop. Additionally, while considering your desktop’s setup, you should consider the amount of stuff on your desk in regards to weight rating. Too much clutter is not only distracting, but can affect the performance of your desk’s motor as well. Remember that your tabletop does not factor into the weight rating of your base. Then, you’ll have to account for the weight of your computer, monitor and monitor arms, and any other accessories like printers. Another factor is that objects will likely be unevenly distributed along your desktop, creating what’s known as side-load stress. For instance, your monitor arms are mounted to the back edge of your desk, which creates more stress than objects in the center of the desktop. The weight limit for your desk may be lower if most of the weight is side loaded. Be cautious as you start to approach the weight limit for your desk, as you may end up reducing the lifespan of the motor in the long run. This issue can be compounded if the desk is not level. Standing desks enable you to combat sitting disease and get your work done in a healthier and more productive way. The kicker is that you actually have to stand in order to get the benefits. Most workers are used to spending eight hours a day sitting at work, with additional time spent sitting during their commutes and at home. 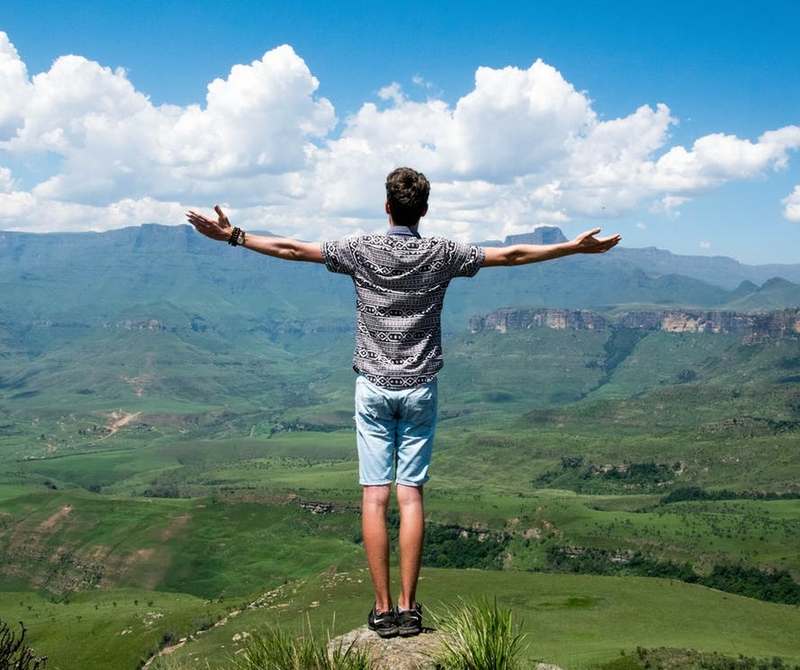 Standing up for any significant amount of time is going to require a shift in your everyday behavioral patterns, and for some people, even the idea seems scary. If the idea of standing for eight hours a day seems daunting, fear not—you don’t have to (and in fact, doing so can cause health problems.) Start with just an hour a day of standing while working—either broken up into two half-hour sections or all at once. You can increment up by five minutes per day until you get to two sessions of two hours each. At that point, you’ll cut your sitting time at work by half, assuming an eight hour day. You can continue to increment from there until you find the perfect amount for you. It’s also crucial to remember to change between positions (sitting, standing or walking) every two hours or less, encouraging blood flow so you can kick your sedentary habits to the curb. The goal is to keep your muscles at rest and prevent strain as much as possible by working from a neutral position. To achieve this, your keyboard should ideally be placed with front side (closer to you) being higher than the back. Accessories like monitor arms or a SteadyType™ Keyboard Tray are essential in achieving an ergonomic setup. One of the most frequently cited problems of first-time standing desk users is foot pain. When you’re standing in one place for a long period of time, standing mats are the best way keep your feet comfortable. 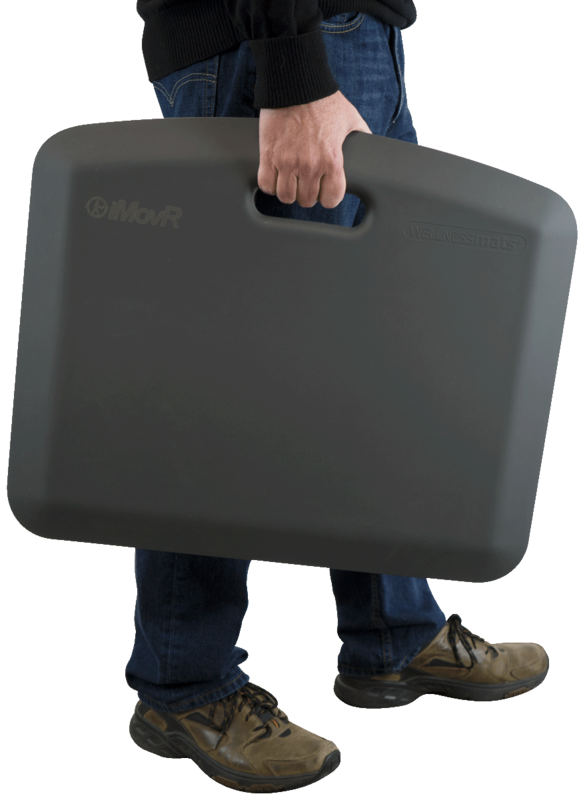 iMovR’s Ecolast Premium line of standing mats are made of 100% polyurethane at .75” thickness, a clinically proven formula to reduce fatigue and foot pain associated with standing, while improving posture to boot. It’s amazing the difference a good standing mat can make. In addition to standing mats, iMovR offers several other accessories to make the road to better health simple and smooth. Monitor arms are the key to keeping your monitor at eye-level. If your monitor isn’t high enough, you’ll constantly be looking down, eventually leading to neck pain. 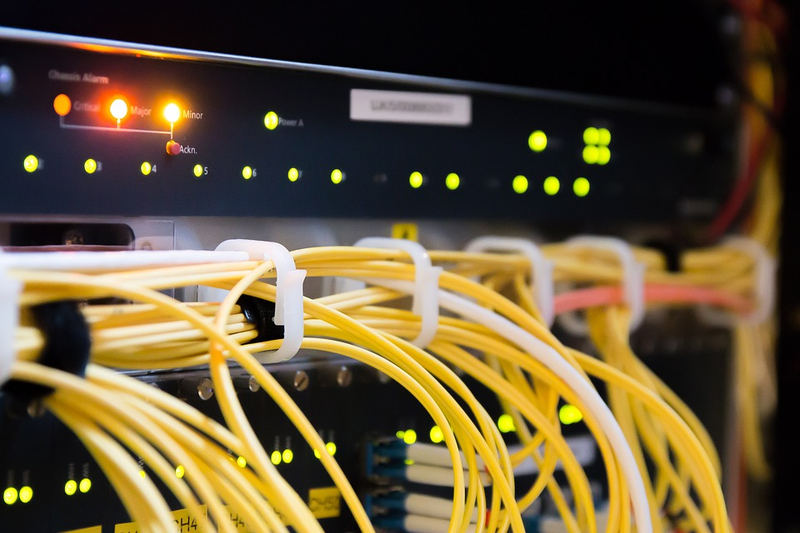 Your computer, monitors, and standing desk all need to plug into electrical outlets, plus any additional electronic accessories that may reside on your desktop. It’s easy for your cables to quickly become a mess. iMovR offers two cable management kits to help keep your workstation tidy. You don’t have to give up your storage space in pursuit of a healthier workstation—the iMovR Mobile File Cabinet lets you retain your under-desk storage in a finish that will match your desktop. It’s impossible to achieve an ergonomically sound workstation when your desk isn’t high enough. iMovR is unique among standing desk manufacturers in that we go out of our way to accommodate taller standing desk users. When you’re using a treadmill, you instantly add 5” of height, which requires you to change your setup for proper ergonomics. Our desks go all the way up to 50.5”, plus available height extenders, accommodating users up to 6’2”. Operating a walking treadmill is both simple and fun—however, as with any piece of machinery, there are a few easy things you can do to ensure that everything runs smoothly, both before you set up your equipment and as you continue to use it. Setting up your treadmill correctly the first time will mean less stress later, plus a longer life for your equipment. One of the big benefits of treadmill desking is that it doesn’t feel like a chore—and maintaining your treadmill doesn’t have to feel like one, either. Let’s start with the obvious: make sure you have enough space for your treadmill. The iMovR Thermotread GT is 67.5" x 28.35", and requires a minimum clearance of 40” behind the treadmill and 20” on either side. This is a significant amount of room, and your local fire safety codes may require additional room, so please ensure that you’ve cleared your space adequately. You’ll also want to make sure that your treadmill (and desktop, for that matter) are on firm, even flooring. Solid floors or low-pile carpets are ideal, while shag carpeting should be avoided. Once your treadmill is in place, you can adjust your treadmill to make sure it’s perfectly level. This will reduce torquing forces on the frame, which can cause the belt to move out of position or produce irritating noises, or reduce the life expectancy of certain components. Finally, you’ll want to position your treadmill so that your feet are centered and as far towards the front as possible without hitting the motor housing while walking. Your treadmill should have access to a 110 volt 10-amp grounded circuit. Please note that these are different from GFCI (ground fault circuit interrupter) type circuits. Large appliances tend to trip GFCI circuits, and a treadmill is no exception. If you aren’t sure which type your outlet is, you can always consult an electrician. Additionally, if you’re using an extension cord, make sure it has only one outlet, which should be of the three-prong grounded type. Remember what happens when you rub your feet on the carpet? 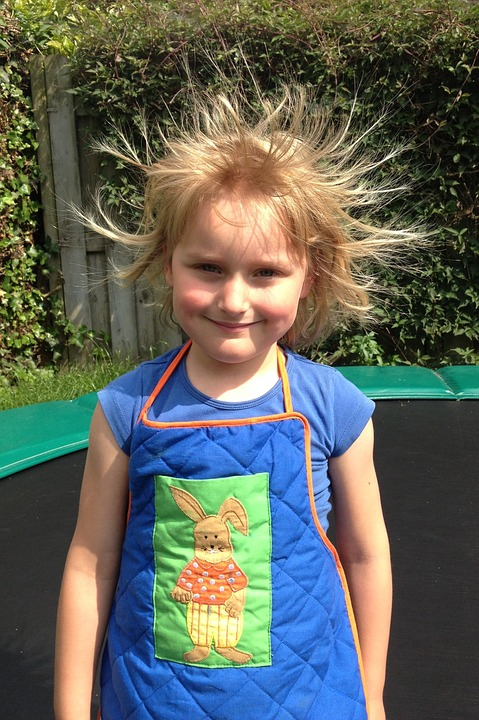 You get charged up with static electricity. The same thing can happen when walking on a treadmill. If you find yourself experiencing occasional static shocks, there are a couple of things you can do to alleviate this. The best way to avoid static build-up while walking on a treadmill is to use one of iMovR’s RightSize™ Under-Treadmill Mats. They are particularly helpful in cold, dry environments. Plus, the RightSize mats are designed to fit seamlessly under the ThermoTread GT. They will also help to prevent dust and dirt buildup, which means you end up using less lube and saving money in the long run. While an under-treadmill mat will likely solve your static problem, you have another option available to you. Using a keyboard that is not physically connected to your computer will break the circuit and prevent static discharge, and possible harm, to your computer. While you may still experience annoying static shocks yourself, you can at least rest assured that your computer will be safe. You should lubricate your treadmill every forty hours of use, or whenever power consumption increases by more than 10% due to increased friction. This is an essential step in keeping your treadmill running smoothly. 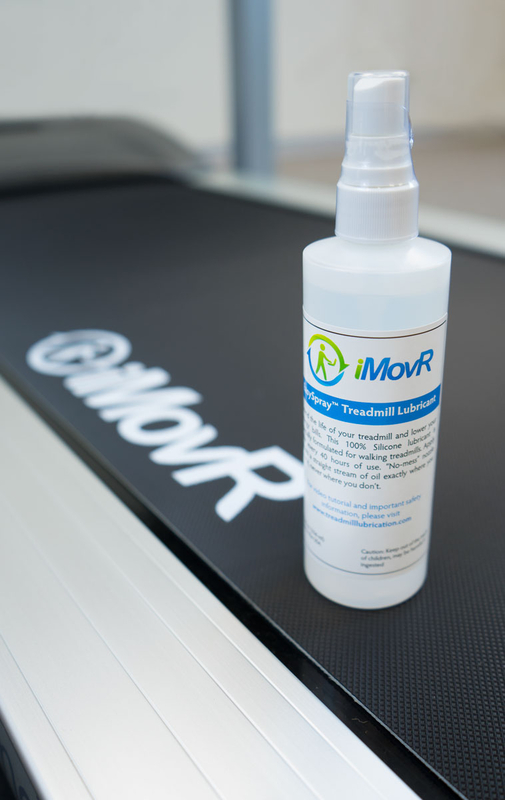 The process for using iMovR’s Treadmill Lube is incredibly simple—simply lift up the belt and spray the lube underneath, in a line from the center of the board out towards yourself. Try to get the areas where your feet land most frequently. Then, simply take a walk on the treadmill to spread the lube out and ensure continued smooth operation. You can only do this if your treadmill is perfectly level. Your treadmill belt may periodically become misaligned, especially if your gait favors one foot over the other. You can fix this by making a slight adjustment to the belt using an included Allen wrench. You want to make very small adjustments while the treadmill is running at a speed of 2.5 mph, and then give the belt time to find its new position as the treadmill runs. You can always tell if your belt is misaligned if your treadmill is making odd noises. Make sure to clean under your treadmill belt periodically, in addition to applying lubricant. This will ensure that your treadmill uses as little energy as possible while extending the lifespan of your equipment. Once a year, you should remove the motor housing and vacuum the accumulated dust inside the motor. For more detailed information on maintenance for the ThermoTread GT, see the ThermoTread GT Owner’s Manual. Let’s get this out of the way at the start—when most people think treadmill, they think running, which has been the primary purpose of treadmills for a long time. 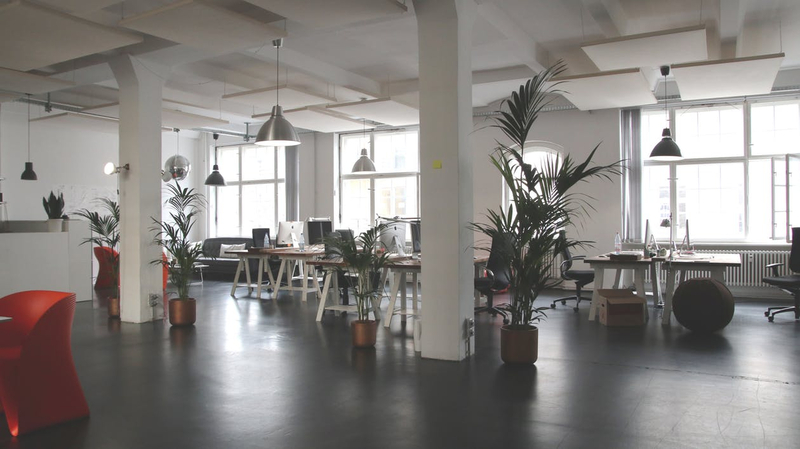 The thought of running in an office environment naturally leaves people skeptical. Office treadmills, such as iMovR’s Thermotread GT, are completely different—they do not go fast enough for anything more than walking. This ensures safe usage when paired with an office desk. But why intentionally limit the functionality of a treadmill? It’s not like traditional treadmills cannot be used at walking speeds. * While the answer partially has to do with the specs of the motor, another large benefit is that its low speed prevents liability issues. Your legal department has no reason to restrict your use, since you’re not introducing anything dangerous into the office—it doesn’t go faster than 2.5 miles per hour! The other key feature of the Thermotread is its built-in liability waiver (similar to what you’d find required on a GPS navigation system in a car). Every time a user boots up the treadmill, they must agree to a safety statement that ensures proper use of the treadmill. This not only informs users of what they’re supposed to be doing, but more importantly, it alleviates the concerns of scrupulous legal departments—and as explained above, there is very little actual danger in using a treadmill at such a low speed. Finally, you can be sure that the ThermoTread GT is safe due to its UL certification, meaning that it has passed the industry-standard in rigorous testing. Our treadmill was designed so that your legal department will have nothing to worry about. Treadmills in the office are a new phenomenon, and while those with the treadmills are excited, others in the office might be a bit more skeptical. They might be worried about noise, or they may feel awkward about interrupting you while on the treadmill. While these issues aren’t integral to anyone’s health, we think it’s important to unravel the minutiae of office treadmill desking so that everyone involved can have the best experience. The noise problem is simple: the best way to keep quiet is to choose iMovR’s ThermoTread GT, which has the quietest operating noise level of all office treadmills. It produces less noise than the HVAC system at most offices. In addition to that, we recommend using rubber or soft-soled shoes that have a quieter footstep. High heels and boots should be avoided when trying to minimize noise. The other common problem falls under the category of “approachability.” Coworkers may feel concerned about interrupting you while you’re walking, as you’re actively engaged in walking (and you’re six inches taller to boot). However, using a treadmill desk should never preclude communication. If you expect a shorter conversation, you may as well keep your treadmill running. You can choose to either keep walking and attempt to talk without losing your balance, or you can part your feet and stand on the sides of the treadmill. Your second option is to stop the treadmill. This makes sense for longer, more involved conversations. You may even want to step off of the treadmill and take away your probable height advantage. While the general principle is the same, treadmill ergonomics are a little different from standing desk ergonomics. Because your body is in motion, you put more pressure on your keyboard as you lean forward. By the same token, you tend to anchor yourself to your desk with your hands while you’re walking. Here’s a brief summary of proper treadmill ergonomics. The top of your monitor(s) should be about at eye-level. This goes for non-treadmill standing desks as well. You should use a SteadyType™ keyboard tray for best ergonomics. The natural shakiness of non-SteadyType keyboard trays will be magnified by the extra force you apply while walking. 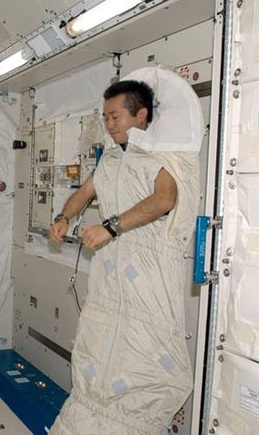 Keep your arms as close to a neutral resting position as possible—see the sleeping astronaut picture below for an example of ideal ergonomics. If your space allows it, we definitely recommend going for a full sit-stand-walk workstation, so you can easily transition between those positions throughout the day. As we never get tired of saying, the next position is your best position. If you’re tighter on space, you can always pop one of our TreadTop Stools on top of your treadmill for sitting or leaning. It’s recommended that you drink eight glasses of water per day. Depending on your lifestyle, this may sound anywhere from reasonable or ridiculous. However, we at iMovR side with science and encourage you to go out of your way to stay hydrated. 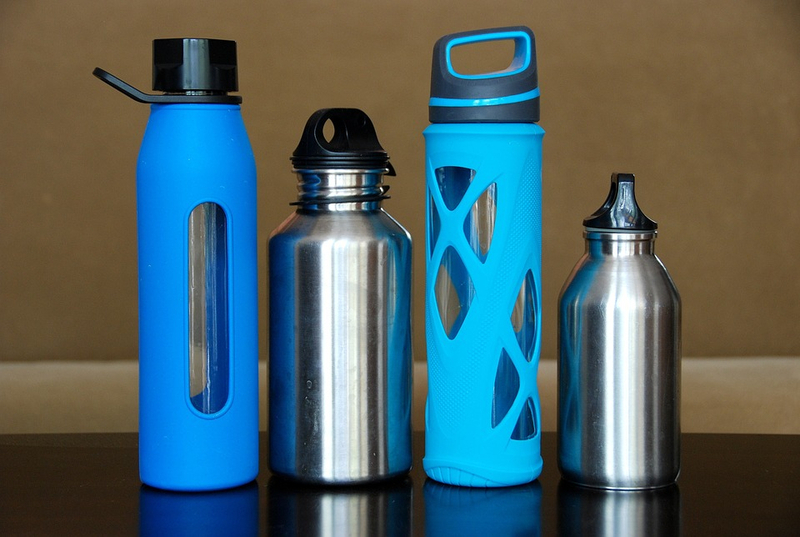 The simplest solution is keeping a water bottle at your desk, but if you’d rather not, getting up to get water throughout the day is a great way keep moving and take breaks. While sweating isn’t a problem associated with treadmill desks for most users, the NEAT that they provide raises your body temperature by definition (thermogenesis = heat production.) This rise in temperature might be enough to push you over the limit into sweating, especially if you’re in a hot environment or if you’re just naturally inclined. A simple solution is to use a tower fan. This should be more than enough to compensate for the heat generated by walking. Let’s get this out of the way first—you can still talk on the phone while walking on a treadmill! 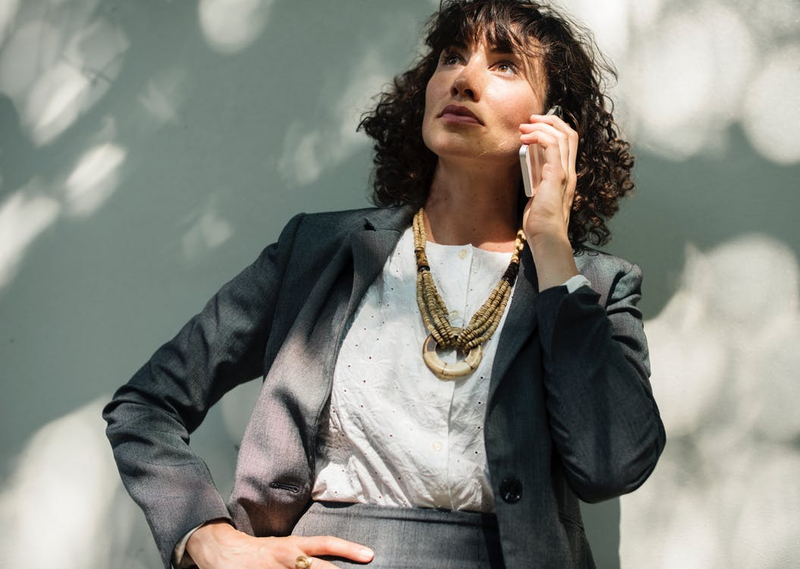 Some users actually prefer to walk and talk, as they naturally tend to pace while having long phone conversations anyway. The ThermoTread GT's low noise level is essential for this—you don’t want the other party to be distracted by your treadmill. For this reason, we also recommend following additional steps for reducing noise: use sneakers or other soft-soled shoes, and if you’re using a fan to keep cool, make sure it’s positioned so as not to blow into the microphone. 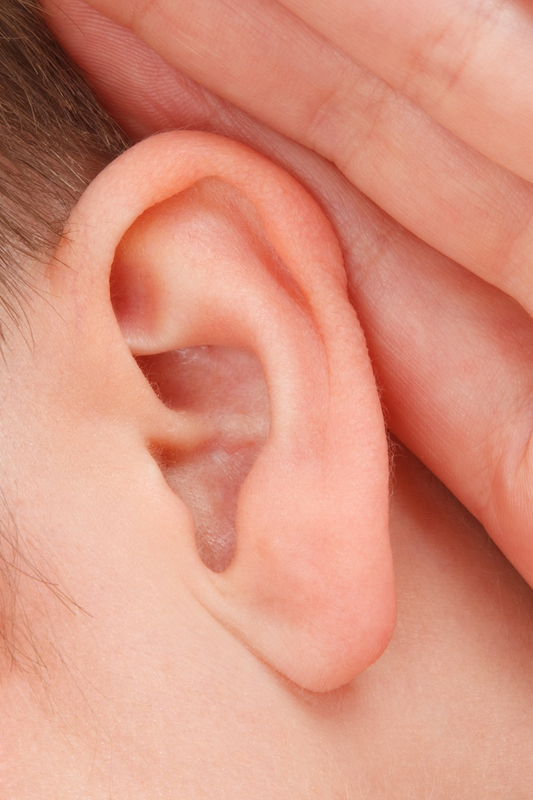 There are a couple of things that work in your favor for talking and walking. The first is that people tend to speak 20% louder while talking on a treadmill as opposed to talking while sedentary. This makes sense, as your body is in motion and your lungs are more open, enabling better vocalization. The second is that some users report shorter, more efficient conversations while treadmill desking. While this is merely anecdotal, it does make sense—more energy from walking translates into more focus and less wasted breath. Whether it’s mildly messy or horridly hazardous, your growing collection of cables needs to be tamed. Every new device that you add to your desk demands another cable, increasing the potential of unsightly tangles. And that’s not counting the stuff around your desk—a treadmill, lights, and fans which also contribute to clutter. Keeping your cables tidy is an essential skill at home or in the office, and a standing or treadmill desk presents a unique set of challenges that iMovR is uniquely prepared to solve. When switching to an adjustable height desk, any cables that used to drop behind your fixed-height desk’s rear panel are now suddenly visible, becoming more noticeable the higher your desktop goes. The only way to solve this is to bind the cables to the underside and frame of the desk. The advanced kit includes all of the above plus a power strip, and a cable tray in which to hold it. You can attach the tray to the underside of your desk (it has an adhesive bottom, but can also be screwed in if required) so that you can plug in your devices right under the desk. Before you start, raise your desk to its maximum height and make sure your cables are of sufficient length—you wouldn’t want to attach any cables before realizing that they’re too short. Next, you’ll want to collect and coil your cables neatly and bind them with them with zip ties, effectively making one large cable braid. You’ll want to use a zip tie every one or two feet. In addition to the standard type of zip tie, iMovR’s cable management kit includes resealable ties which allow you to add or subtract devices from your workstation. Next, you want to take your cable braid and attach it to the underside of your desk using the adhesive wire clip organizers. Guide the cable to one of the legs of your standing desk. If you like, you can use the cable sleeve to make your cables look even cleaner. Finally, use the magnetic clip-ons to attach to the legs and guide the cable down to the ground. Viola—you’ve solved your cable conundrum! Here's a helpful video. You can also consider using grommet-mounted power supplies for your tabletop power needs. This is great for short, charger-type cables, and for any items that you may wish to frequently unplug and replug.